This article is the second of a two-part series about roles in preventing bullying. Click here to read Part 1. Bullying has always existed, although it has not always been consistently and actively addressed in the school setting. Recent research has shown that bullying prevention efforts that build a positive school climate and invite disapproval of bullying can result in many positive outcomes, such as increased positive bystander behavior, decreased support for bullying, increased willingness to intervene in bullying, increased willingness to support bullied students, and increased reporting of bullying. In my last bullying series post, I mentioned the importance of creating a positive climate and fostering feelings of safety through three main adult actions: 1) responding consistently, 2) being affirming, and 3) following through on all bullying reports. In this post, I’ll share how these actions play out in the context of the Weird series of books from Free Spirit Publishing, which can facilitate classroom discussions to ensure students that the benefits of reporting and standing up to bullying far outweigh the costs. Consistency involves all school staff regardless of role. In the book Weird, more than one adult checks in with Luisa when noticing she’s not herself, asking her if she is all right. Students need to know they can report to any adult and that all adults will address the situation without revealing the identity of the reporter unless absolutely necessary. This also means having set policies and procedures in place to respond to bullying. Responding involves everything from having a bullying report form, training coaches who meet separately after an incident is reported with the student who is bullying and the student who is being bullied, having fair consequences for the student who is bullying, and communicating with parents. Although not all staff members are involved in each of these elements, they do need to be familiar with the procedures and how they work. Everyone has a responsibility to receive and document a bullying report. Affirmation is another key to maintaining a climate that discourages bullying. In the book Dare, an adult responds to a bullying report by saying “Thank you for letting me know.” The adult reassures the students by telling them, “We don’t do that at our school.” This support is also shown in the Weird series when Luisa tells her mother Sam is being mean to her and her mother responds by assuring her it’s not her fault and that she’s wonderful as she is. All it takes is for a child to be afraid that adults won’t respond or listen. Use opportunities such as these book discussions to send a clear message that reporting is a good thing to do and will lead to action. 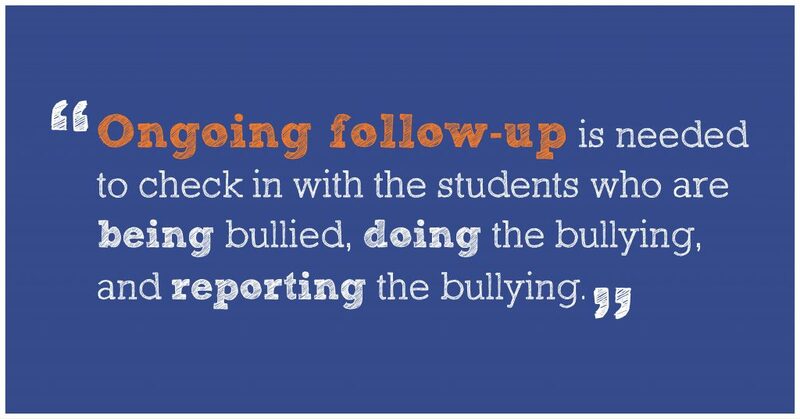 Last but not least, ongoing follow-up is needed to check in with the students who are being bullied, doing the bullying, and reporting the bullying. This may be as simple as asking how they are doing or thanking them again for reporting, revisiting how a strategy is working (with either the one who is bullying or being bullied), or following through on a consequence. The follow-up could come from the classroom teacher, coach, or other staff members, depending on your school’s procedures for handling bullying reports. Although the follow-up piece is not shown in the Weird book series, the readings provide perfect opportunities to ask students what kind of follow-up they might want to see for each of these roles and to reassure them that the adults will support them for the long haul. In case you missed it, click here to read Part 1. Kuppens, S., Grietens, H., Onghena, P., Michiels, D., & Subramanian, S. V. (2008). Individual and classroom variables associated with relational aggression in elementary-school-aged children: A multilevel analysis. Journal of School Psychology, 46, 639–660.